We asked 11 women visual artists at the 2019 phenomenal women in philly event what being phenomenal meant to them, and why it was important for women to collaborate more. 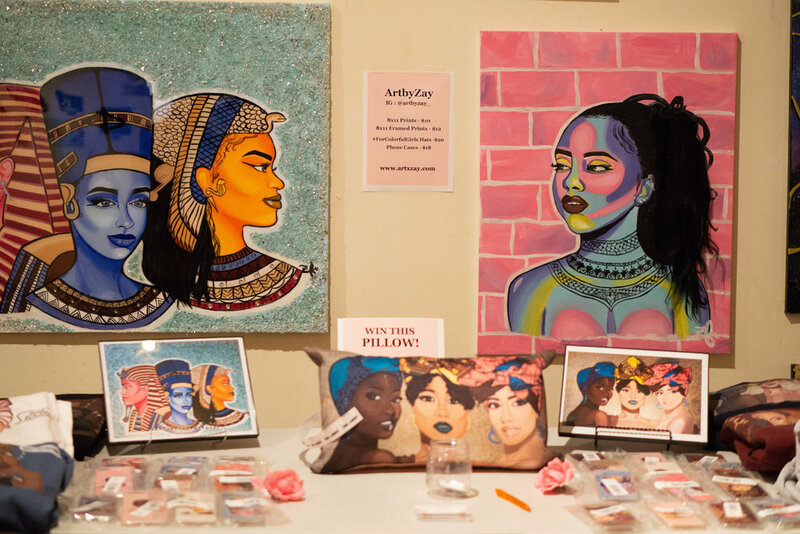 Artist @artbyzay_ showcases her artwork at Phenomenal Women in Philly. “To me, being a phenomenal woman means not only being confident & unapologetic with who you are, but also uplifting other women to feel the same about themselves. “What being a phenomenal women means to me is simply being your true authentic self while walking in love everyday. I like to think of myself as a very sensitive, passionate, and loving person. I pay close attention to details when it’s comes to anything circling the idea of love. I’m not perfect, but I’m willing to learn, keep trying, go through experiences, and have it shape into my being. Whether it’s self, platonic, romance, short-lived, or unconditional; it all matters and means so much more. I go by a motto of never letting this world turn me cold, but to respond with love. “Being a phenomenal woman means to never lose touch with your inner self (your essence; the soulful qualities of yours that no one could ever reach let alone alter). Being a phenomenal woman means to seek, to create, to speak, and to play so freely and so far away from every “should” and every “must” you have ever heard or been subjected to. Being a phenomenal woman means being effortlessly extraordinary by force of nature. It means what ever may challenge us we work hard to overcome it and make it our strengths. We live in a world that has constantly tried to divide us by pinning us against each other but I’ve learned over the years that we are more powerful when we work together. We can accomplish so much more when we bring all of our gifts together. Being apart of an identity that is marginalized socially, sexually, politically, and being that we do often times face violence because of our identification, I think it’s important that we as sisters create safe inclusive spaces of solace as much as possible. This way we can celebrate and stand in solidarity while at the same time be resources for each other. It’s important that woman collaborate because communication is the first thing that sparks change. The nature of collaborative art is very engaging and it functions like a conversation. There’s compromising and learning when to assert yourself and when to let someone else have a spot light. Inherently, Art is political. Artists are trying to say something and engage an audience, and there’s no better way to do that then include many strong voices. Being a phenomenal woman means being me. Just being a women stamps us with pure dopeness. Women are the warriors, and that fact alone is why we should she build on that momentum together. It’s important to collaborate with women because it’s all about energy transfer. When women get together there’s undeniable magic that fills the air. Instead of constantly going toe-to-toe, I rather work along side my sisters hand-in-hand. What’s better than one dope chick? A tribe of dope chicks. @jas.tot and @djdiamondkuts pose with the Diamond Kuts inspired Phenomenal artwork created by Jas herself.